Oxygen is an element that can be a solid, liquid or gas depending on its temperature and pressure. In the atmosphere it is found as a gas, more specifically, a diatomic gas. This means that two oxygen atoms are connected together in a covalent double bond. Both oxygen atoms and oxygen gas are reactive substances that are essential for life on Earth. Oxygen gas, also called dioxygen because it is a bond of two oxygen atoms, is the second-most abundant element in the Earth's atmosphere, accounting for 21 percent of the air we breathe, well behind nitrogen's 78 percent. Pure oxygen gas has a specific gravity of 1.105, according to ligas.com, meaning it would sink under the rest of the atmosphere if there were no wind or air movement on our planet. Oxygen gas reacts with every element, with the exception of noble gases. The products of these reactions are called oxides. With some elements, such as magnesium, oxidation occurs at standard temperatures and pressures, while heavier elements require high temperature and pressure to force oxidation. 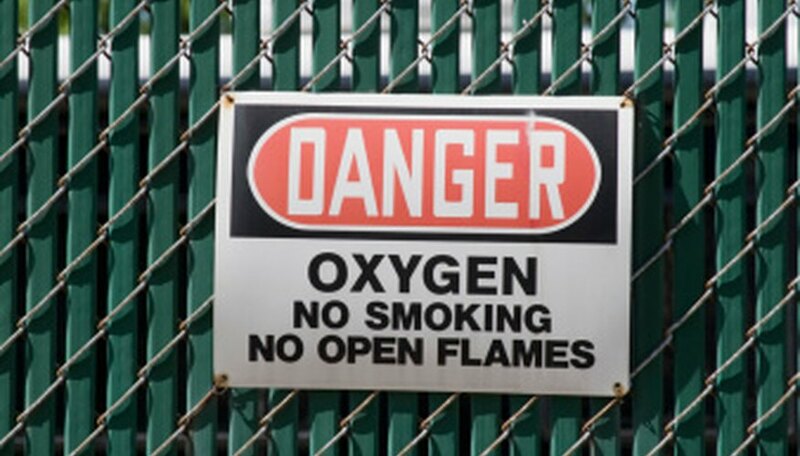 Oxygen is essential for combustion, even though the gas itself is not flammable on its own. Many industrial heat-treating operations depend on bottled oxygen to increase their burning temperature. Common water is actually 85 percent oxygen, despite the fact that there are two hydrogen atoms for every oxygen atom. The human body is approximately 60 percent oxygen, which is one of the reasons scientists scan other planets for oxygen as a potential sign of life. As part of oxides, the element makes up about 46 percent of the Earth's crust. Oxygen gas in the atmosphere has two forms; dioxygen (O2) and an allotrope of oxygen called ozone (O3). The depleting layer of ozone is a scant 3 mm thick, though the continued expulsion of freon into the atmosphere lessens it as time goes on. Oxygen gas is a colorless, odorless and tasteless substance, while ozone and liquid oxygen have a bluish tint to them. Ozone's boiling point, 161.3 degrees Kelvin, is higher than that of O2 gas, 90.2 degrees Kelvin. Similarly, ozone's melting point is 80.7 K while O2 melts at 54.36 K. Ozone is denser than oxygen gas at 2.144 g per liter to 1.429 g/l, respectively. Oxygen is essential to our respiratory systems, providing the basis for metabolism, while its allotrope, ozone, is actually highly toxic. Leenhouts, Doug. " The Differences of Oxygen & Oxygen Gas." Sciencing, https://sciencing.com/differences-oxygen-oxygen-gas-8062344.html. 25 April 2017.